Maybe it is because we have a very good beds with individual lights and lockers, air conditioned bedrooms and we are always cleaning the Submarino (mainly the bathrooms). 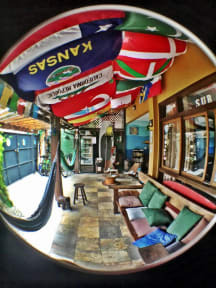 Maybe it is because the Submarino is a very safe place, fun and very well located in the best neighborhood in Florianopolis, 50 meters to the lagoon and 15 minutes to the best beaches. Maybe it is because we have a big TV with a big movies collection, kayaks, stand up paddles, bikes, surfboard, ping-pong and pool table, barbecue area, two complete kitchens, wifi zone and a cool environment with hammocks to chill. Maybe it is because the Submarino is run by a family (brother and sister) that was born and grew up in the island and can give you the best tips. But probably it is because we really love this job and we are always trying to make sure that you have the best time of your life. Come join this family and draw your own conclusions about how to embark in the Submarino. Estadia maravilhosa no submarino, me senti muito em casa, sem falar nos detalhes do hostel, tudo muito organizado, muito limpo. O staff é maravilhoso, a Pia, a Paola, a Simona, a Anabel, e o Giulio, maravilhosas pessoas. Retornarei muito em breve e com toda certeza me hospedarei no submarino novamente. Foi muito confortável passar esses dias por lá. Muito obrigado! Very good hostal, calm, nice staff and good kitchen. Super cozy hostel in a very nice town :) Stayed at various places on the island near beaches and I was grateful to stay a night near the lake and to have the chance to explore the town. Met some cool people and the home felt very comfortable. Recommend! Lovely place to stay - the staff are brilliant. Julio is a brilliant character and his attitude is felt all round the hostel. Very comfortable beds with good Wi-fi and strong showers. Laundry facilities and bikes for hire! Small kitchen but plenty of places to eat close by! Would recommend. One of the most organised hostels I've been too. They've thought about everything from heaps of electrical sockets to little baskets next to all the beds for your belongings. Only thing is that they don't offer free breakfast but that wasn't a big deal for us. Staff and owners were friendly and really helpful. Julio and the staff are great. Lovely little hostel a short walk from lots of bars, restaurants etc. The staff were super helpful with info about the area. The 6 bed dorm was on the small side but the beds were pretty comfortable. Good facilities for laundry and cooking. Cons: Our room was in a separate building from the actual hostel and the only people in it were us and a few members of staff, so unfortunately we missed out on the social hostel atmosphere we were hoping for. The doors and windows were left open constantly despite us closing them whenever we came back in, and this led to a lot of. spiders, cockroaches and other bugs. Pros: Staff were very helpful, washing service was great and free towels were very useful. Location was gorgeous. Our room smelt of cats wee and the general cleanliness of the hostel wasn’t great. Rooms are also small so limited storage space. Good cooking facilities. Location is a 15 min walk from main town.